The first consideration when choosing your new microwave is what you will be using it for – we offer basic models ideal for simple tasks such as heating and defrosting, or microwaves capable of doing much more. From browning, roasting, weighing and many other intelligent features. You can even consider a Combination Microwave which offers the advantage of including a conventional oven for more traditional cooking results. 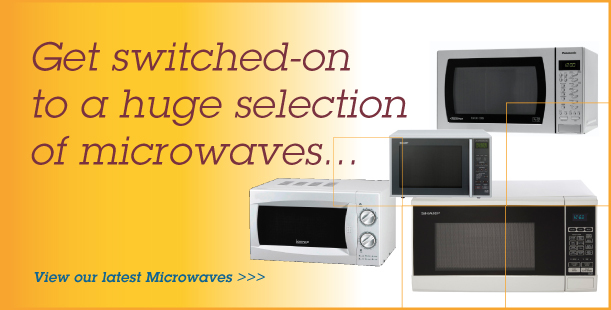 We stock microwaves with various power levels. The higher the power level the quicker food will reheat and cook, most popular models have a power level between 700 and 900 watts. Operating functions are either twist dials or digital buttons. Our showrooms stock a variety of makes, models, sizes and colours for you to browse so we’re sure to have the right one for you. If you’d like more advice on selecting a Microwave why not call us or visit our Showroom, we’re always happy to help!